"David Lough #9 of the Baltimore Orioles celebrates as he hits the game-winning RBI single to score teammate Stephen Lombardozzi (not pictured) against the Toronto Blue Jays in the twelfth inning at Oriole Park at Camden Yards on April 12, 2014 in Baltimore, Maryland." Nothing kicks off spring better than major league baseball being back in Baltimore. Sitting in the photo-well next to photographer friends, on 65 degree nights, with a bag of sunflower seeds is what makes the cold months of winter vanish from our minds. Camden Yards always brings a positive recharge to everyone in Baltimore each April. My first series of the year was shot for Getty Images as the Toronto Blue Jays came to town to take on the Baltimore Orioles. A great battle, the Orioles would come up short, dropping two games in the three game series, but not without a fight. On Saturday night, a low-scoring battle between good pitchers, turned into an extra-inning thriller. David Lough of the Baltimore Orioles would hit the game-winning RBI single to score a teammate in the twelfth inning. 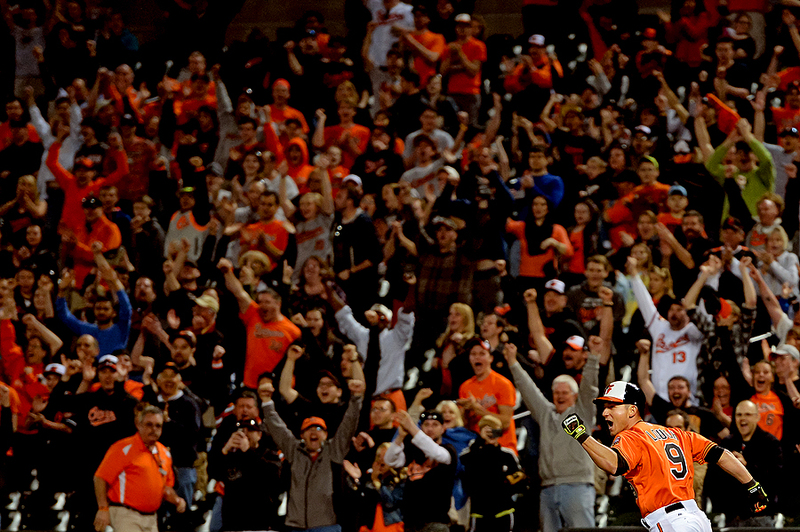 Here are a few of my favorite images from the first of many series at Camden Yards this year.